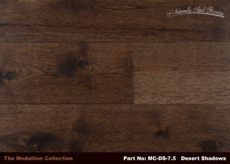 Desert Shadows is a dark hardwood floor that brings a rich and elegant appearance to any room it fills. 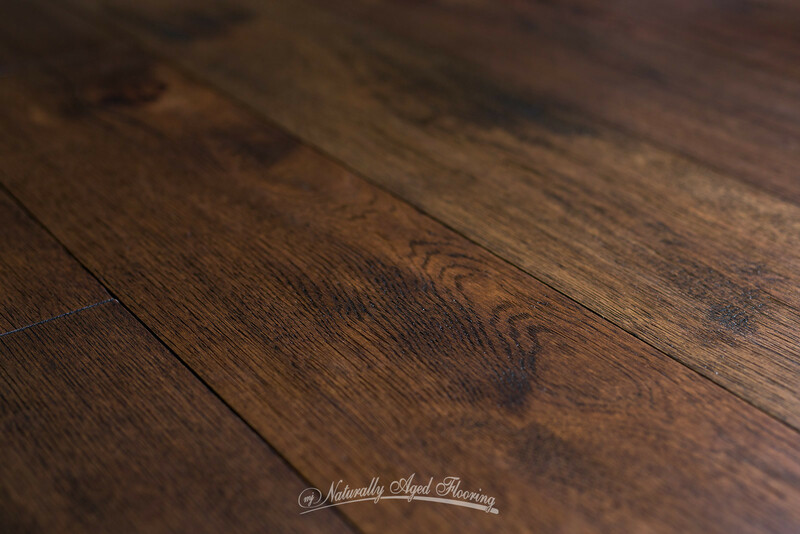 Naturally Aged Flooring's Medallion Collection is one of the most popular collections of engineered wood and is of the highest quality. The species is Hickory, one of the hardest woods offered, which provides lasting value thanks to its durability. 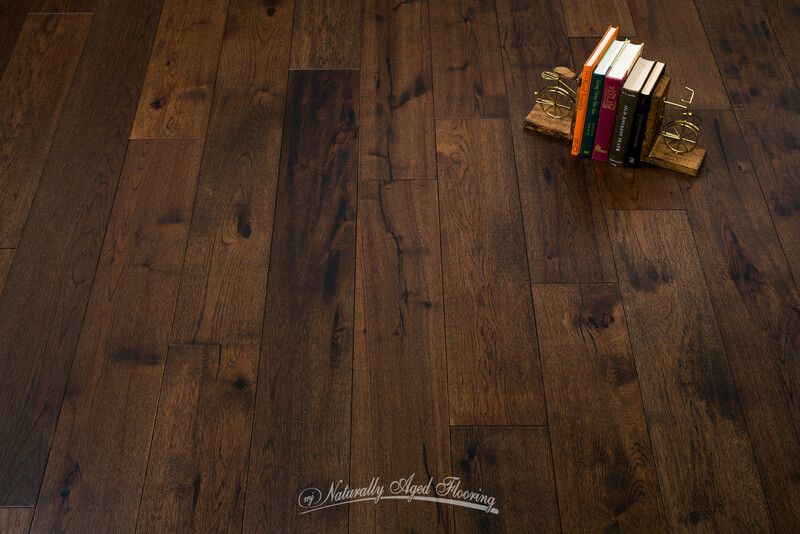 This floor will hold up in any scenario, from a showcase home to a busy household, providing peace of mind. This floor features the current trends of wide planks, rich distressing and a low gloss surface. 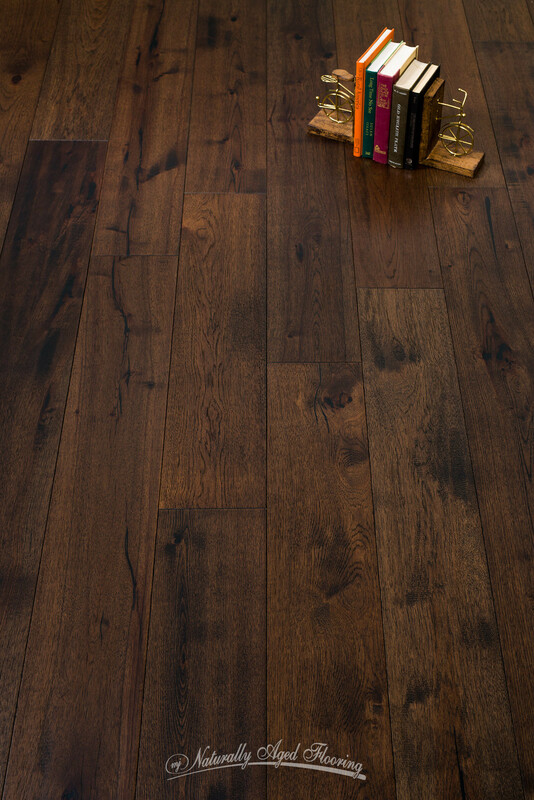 The knots and black fill throughout add to the elegance of this flooring. The even wire-brushed distressing gives a weathered feel with a noticeable texture in the wood grain. A light amount of hand-scraping produces an expensive look & variation between boards, while the chatter varies from light to medium giving this floor even more delicious character. With Desert Shadows it's easy to visualize an old world Mediterranean design with vaulted beamed ceilings, rich patterned materials, leather furniture, large fireplaces, ornately carved tables, and a kitchen with stone surfaces, rich wood cabinets that give a feel of elegance and comfort all at the same time. A French Country design with overstuffed sofas, vintage pieces, beautiful colors on the walls and a kitchen with distressed cabinets and carved accents would also be beautifully complimented by this hickory hardwood flooring. Rustic Cottage design with its natural elements, stone, wrought iron and wood create a comfortable, inviting environment while unique architectural adornments and open floor concepts allow for a distinguished hardwood floor like Desert Shadows to seamlessly transition from the living space into the kitchen. 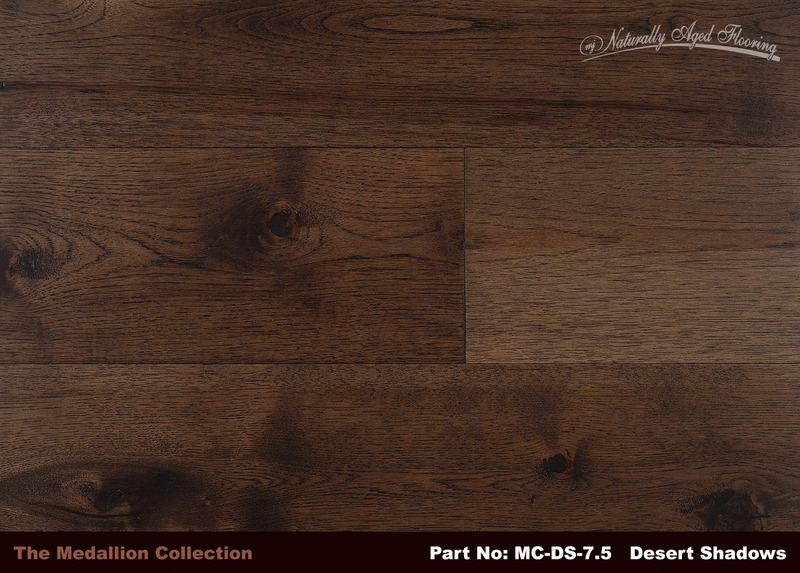 This majestic hickory hardwood flooring is so versatile that whatever your design style, Desert Shadows will give it a rich look that everyone will love.